A real weekend showstopper! But as we all know, it’s not about how pretty things are on the outside, it’s what’s going on in the inside that really counts! The ingredients list will be music to any healthy foodie’s ears. I always love to hear about the health benefits of the food I make, almost as much as I enjoy actually eating it! A diet high in the ancient gluten-free grain Buckwheat has been linked to lower risk of developing high cholesterol and high blood pressure. The pumpkin seeds, flaxseeds and chia provide an excellent source of vitamins and minerals, as well as anti-inflammatory Omega 3s. It is only naturally sweetened with bananas and dates and is full of fibre, protein (14g to be exact) and complex carbs for slow release energy. Topping it off with a rainbow of brightly coloured fruits seriously ups your disease-fighting game as it provides a ton of antioxidants and almost a third of my daily Vitamin C requirements. I automatically become the favourite person in our house on a day that I make this. The kids feel like it’s an indulgent treat, as I sit quietly smug in the corner, safe in the knowledge that it is actually jam packed full of nutrient dense ingredients that will start the day off right. I experimented with adding a plum/berry chia jam as a filling underneath the yogurt and it worked perfectly. However this step is optional if you’re short on time — I just happened to have some left over in the freezer and it would have been a crime against deliciousness not to actually use it. NOTE: I tend to make the base the day before (and store it in an airtight container) to save precious time in the morning. So all that is left to do is assemble the pizza and create your masterpiece! · Place the bananas, flaxseeds, flour, dates and protein powder in a high speed blender and blitz until the dates are well mixed. · Transfer that mixture into a bowl and add the oats, pumpkin seeds and the yogurt. · Mix well — I use my hands, but be warned it’s very sticky! · Bake for 40–50 minutes or until golden brown where the edges are starting to get crispy. · While the base is cooking, make the jam as follows — Wash and chop the fruit. · Simmer on a low heat for 10–20 mins or until the fruit is very soft (berries will need less time, rhubarb, apples and plums will need more time). You might need to add a tbsp more water every now and again if it gets too dry. 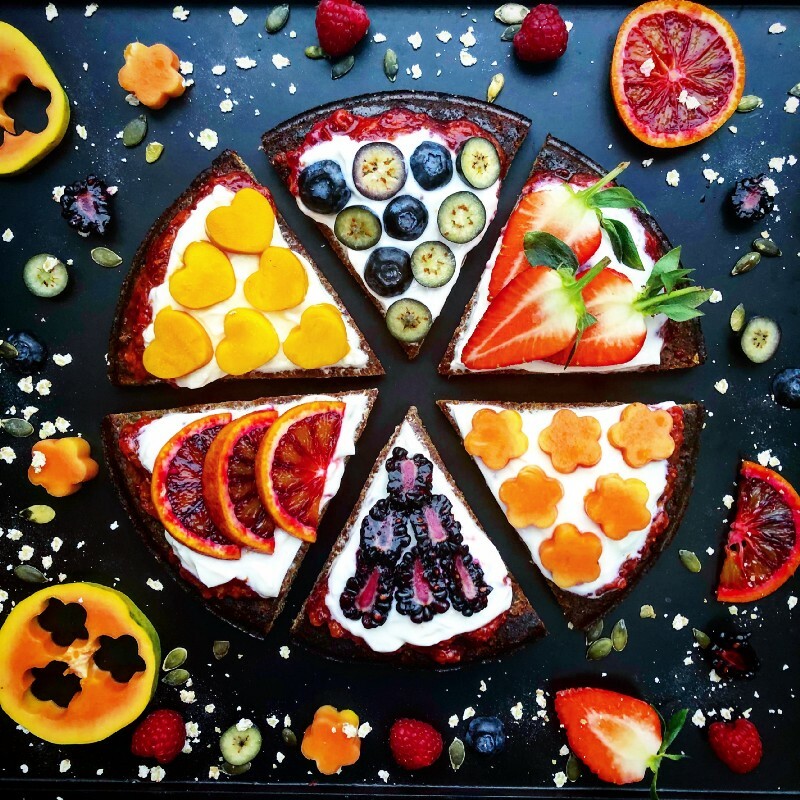 · Once the pizza base has cooled, spread with the chia jam, yogurt and decorate with the fruit and enjoy the naughtiness of having pizza for breakfast! Leek, Kale & Pea Fritt-uffin….or is it a Muff-ata?